Some illegal marijuana is grown in homes, abandoned buildings, barns and farms, but the biggest grows are found on wildlands, where the grow is more likely run by an international cartel that uses illegal toxic chemicals to get their pot to grow faster and bigger. The US Forest Service says that every National Forest and National Park in California has been claimed by an international cartel, for their use growing marijuana, making meth and smuggling. The same is true for BLM lands, US FWS wildlife refuges and some of the Army Corps of Engineers reservoirs. If cartels don’t agree who runs grows in a certain wildland, the matter is usually settled there, resulting in graves of growers who lost. This isn’t just a problem in California. Almost four million plants are removed from illegal grows on public lands nation-wide every year, and this is estimated at less than 20% of what’s actually out there. As of 2016 cartel marijuana gardens have been found in 67 National Forests in 21 states. Other states with significant cartel gardens on state and federal wildlands include: Colorado, Oregon, Michigan, Wisconsin and Kentucky—especially in the Daniel Boone National Forest. Hundreds of meth labs have also been found on wildlands in all 50 states. Just who removes illegal grows? The first things that may come to mind are police SWAT teams or heavily armed DEA agents. They do some eradication, but they have a lot of other things to do. 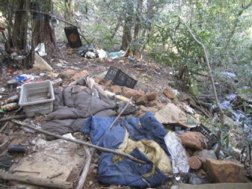 Wildlands law enforcement agents are the primary removers of illegal pot gardens in the woods. A decade ago there were nearly 1000 Forest Service Law Enforcement Officers (LEO’s). Today there are only 550 to cover all National Forests. The BLM is responsible for managing more land than any other federal conservation agency and yet there are only 300 BLM law enforcement officers for the entire country. There are 1500 Rangers for all the US Army Corps of Engineers made-made lakes and recreation areas for the entire US, and most do not carry firearms. In 2005 there were 1548 National Park Service Rangers. By 2014, there were 1,322 and less than 400 seasonal rangers. The bottom line: Some of our most active wildlands drug enforcement warriors are game wardens -- who many Americans mistakenly assume spend their time checking fishing and hunting licenses, and limits of fish and game, and looking for poachers. Right now there are approximately 8,000 state game wardens for the entire US and about 1000 in Canada; about as many men and women as the New York City Police Department deploys on Times Square at New Year’s Eve. MET squad. All photos by Lt. John Nores with permission. In part due to the shortage of wildlands law enforcement officers of all types, the land area where many criminal cartels are growing marijuana in our regional, state and federal forests, parks and wildlife refuges is increasing and California is the leader. The Forest Service reports that in 2012 nearly 83% of the 1,048,768 plants eradicated from national forests were eradicated in California. California is a leader in illegal marijuana grows, but California’s game wardens have also become a leader in combating them. Nation-wide there are three states with tactical units of game wardens – Florida, Texas and California. 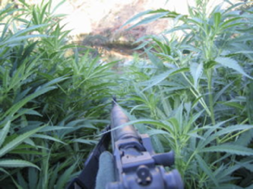 California’s tactical unit, the MET squad specifically targets trespass marijuana grows. “We estimate less than half of the California trespass grow sites in operation each year are detected and eliminated,” says Lt. John Nores, Jr., who has headed the California Fish and Wildlife Department’s tactical Marijuana Enforcement Team (MET) until his retirement in December of 2018. According to Lt. Nores, at least 3,000 to 5,000 organized crime-operated “trespass grows” are identified each year on California’s wildlands. Many of these sites are typically in excess of 1,000 plants per site, some have more than 200,000 plants. Trash at a grower camp. 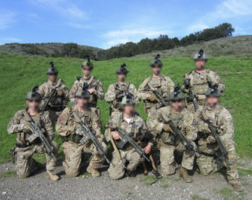 People may think of game wardens as “fish cops,” but MET includes a sniper unit (Delta team), developed to support marijuana enforcement operations, homeland security and other public safety missions throughout California. removing 614 illegal dams that consumed approximately 756 million of gallons of California water during the state’s peak drought. 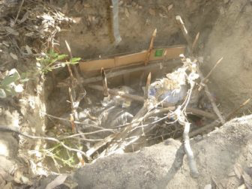 Anti-personnel "Punji" pit booby trap on path leading into a grow. The danger in these grow sites is high. Not only are growers armed, but the sites are frequently booby trapped by punji pits (underground beds of sharpened and poisoned sticks camouflaged on the trail to severely injure those that walk into the grow site), or tripwires attached to guns. “Approximately 85% of the trespass growers apprehended by the MET are here illegally,” says Lt. Nores. The felonies black market growers are typically charged with include: marijuana cultivation for sale, using firearms in the commission of a felony, assault on law enforcement officers, and using banned and highly toxic poisons illegally on private and public land. Cartel growers can also be charged with felony water stealing from the Water Code. Other misdemeanors that are often charged include illegal stream alteration, water pollution, littering near state waterways, and the illegal take of numerous wildlife species. “As a result of the numerous felony and environmental misdemeanor charges, we are seeing an average of 2-year prison sentences for trespass growers caught and prosecuted. Since most are illegal, they are deported following their prison or jail sentences,” said Nores. But, many seem to find their way back into the US. MET officer and K9 handler Brian Boyd, who has worked with K-9 Phebe for the last nine years, reports that she has made 114 physical apprehensions on violent trespass-grow suspects over her career. She has also caught another 740 suspects where a physical apprehension was not required. Essential to the success and safety of MET is “Phebe,” who is one of the unsung heroines of California’s drug war in the wildlands. 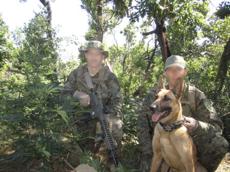 A Belgian Malinois, Phebe has saved the lives of the two-legged members of MET numerous times on dangerous missions, as well as those of other agencies who have partnered with the game warden tactical unit during fugitive-tracking and evidence-detection missions. Along with its mission to stop the public safety threat from organized crime cultivation operations, MET is also dedicated to rectifying the extensive environmental destruction to California’s wildlife resources within these grow sites, through cleanup and reclamation missions. Almost four million plants are removed from illegal grows on public lands nation-wide every year, which is less than 20% of what’s actually out there, according to Lt. Nores. 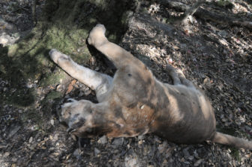 Mountain lion poisoned by toxic fertilizer and pesticides used at an illegal grow site. California’s MET unit and similar efforts have so far have made progress on the new threats to our wilderness areas, but nation-wide the numbers of federal and state wildlands law enforcement officers have been declining in recent years and crime in wildlands has increased. Regardless if there is a sturdy physical wall along our southern border or not, making our wildlands the safe places they should be should definitely be a goal that everyone should be supporting for healthy, safe natural areas are essential to the health and well-being of all Americans.